On Sunday, April 20, 1986, Rev. Louis Demmer, CSV, died suddenly at his residence in Kankakee. The cause of death was a massive heart attack. Father Demmer was 69 years old and this year was celebrating his golden jubilee as a Viatorian. The Funeral Mass was celebrated at 10:00 a.m. on Wednesday, April 23, 1986 at St. Patrick’s Church in Kankakee. A Wake Service was held at 7:30 p.m. at St. Patrick’s on Tuesday evening. Fathers John Durkee and Pat Hayes, both jubilarian classmates, gave the homilies. Louis Demmer was a native of Chicago. He was born on July 25, 1916 and entered the novitiate at Lemont, Illinois in 1935. Following his first profession on September 28, 1936 Louis studied at St. Viator College, St. Louis University and St. Ambrose College. He taught at Cathedral Boys’ High School in 1941 and then entered Kenrick Seminary in 1942. He was ordained on June 21, 1945. 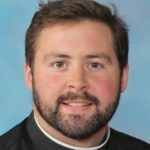 The first fourteen years of Father Demmer’s ministry were spent as a teacher of mathematics and science at St. Philip’s High School, St. Patrick’s High School and Stepinac High School. During that time he also earned a Master’s Degree at New York University. In 1959 Louis changed ministries and began a series of chaplaincy assignments. He served at Manteno State Hospital from 1959-1962, at St. Joseph Hospital in Mitchell, South Dakota from 1962-1966 and at Brady Memorial Home, also in Mitchell, from 1966-1970. 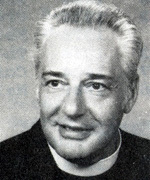 Father was appointed pastor of St. Peter’s Parish in Farmer, South Dakota in 1970. It was during this last assignment that Louis became seriously ill as a result of diabetes. He transferred to the Province Center in 1974 and was hospitalized for some time. During this period he lost his eyesight completely. For the last ten years he has lived in private retirement in Kankakee where he was cared for by several faithful friends. Louis had a long standing interest in using the communication media for evangelization. His project titled “Operation Gabriel” was a dream to record the full text of scriptures, using individual voices, on tape for the blind. The project never materialized, but it was the dream that was important. Please remember Father Demmer in your prayers and gather together to celebrate a Eucharistic liturgy for the repose of his soul.